When my best friend, Robert, retired several years ago, his niece prepared a scrapbook for him. She asked me and some of his other friends to write a memory of Robert to be included in the book. Here is mine. When people have known one another for more than 60 years, said people accumulate many memories. Some of us have zip for long-term memories; others have trouble with short-term memories. Some have no memory at all, but I’m not naming names. Since Robert and I met in the 6th grade (he says the 7th grade) and we’ve spent much time with one another starting way back then, I thought I would plod through my recollections, knowing it would be difficult to select the best one for his scrapbook. As it turned out, it wasn’t hard at all. One memory so stands out from the rest, it was easy to choose. The event I shall relate landed us in the soup, to say the least. Today it would be a minor misdemeanor, but in the 50s it was a felony punishable by death or at least being sentenced to a year of dish washing. Once upon a time around 1953-1954, Robert invited me to go with him on a hayride and cookout. He attended the Nazarene Church, which sponsored the event. I can’t remember who thought of it, but the idea appealed to both of us. We would find some way to obtain a bottle of vodka, with which we would spike the chaperones’ Big Orange drinks when we arrived at our cookout destination. Nehi orange soda pop was stuck with the “Big Orange” appellation in those days because of a popular Andy Griffith monolog in which he referred to the drinks as Big Orange. At least that’s where I think it started. One of our best friends was Joyce Schurman, who was the minister’s daughter. We ran the idea by Joyce, to test the waters, so to speak, to find out what she thought about it and how much trouble she thought we’d be in if we got caught. To our surprise and delight, Joyce thought it a splendid idea and asked if she could join us. So, there were now four of us, counting Joyce’s unsuspecting date, Charles, who would go along, but didn’t wish to take an active part. Never mind; more was better if it became necessary to spread the blame around. Having no earthly way to find vodka, it seems to me we really thought we wouldn’t be able to secure it, making the caper impossible to actually fulfill, but fun to talk about. Little did we know just how easily it would fall into our hands and make our daring escapade doable. My sister’s best friend was from a big drinking family. When my sister told her friend about our plan, she immediately took us to her mother, who obliged by filling a small bottle with vodka and sending us on our way. “Let me hold the baby.” “Would you take care of the baby for a while?” “Be sure to keep the baby covered up.” And so on. Riding in the hay wagon, we giggled all the way to our cookout destination. When we arrived the chaperones (of which there were many, in an abundance of Nazarene caution) they began to set out fixings for a wiener roast, et al. To our giddy delight, we saw the Big Orange drinks opened and lined up on a table very near the edge of the dark woods. It was the work of only a second to figure out how we were going to do the deed. We crouched behind the table, hidden by the trees and the darkness. One of us served as lookout while the other two grabbed a drink and poured some of it on the ground, replacing it with vodka. No one saw us, and after a while, we were able to give the drinks yet another shot of the booze. By the time the Big Oranges were to be drunk, we had completed our mission. We stayed where we were in order to gauge the chaperones’ reaction. To our surprise and amusement, one of the drinkers said, “I think this orange drink is the best I’ve ever had.” The revelation caused us so much mirth, we had to clap our hands over our mouths for fear of being discovered. We were very pleased with ourselves for pulling off the practical joke of the century. I think the hayride was on a Friday night, but I’m not sure about that. It was Sunday afternoon when Robert called me. “The whole church knows about the baby,” he said feverishly. “No-o-o-o,” I stage-whispered into the phone. My mother was in the other room, and I tried to drag the phone into my room and close the door. The cord wouldn’t stretch that far. So, there it was. Damned if I did and damned if I didn’t. I pleaded with him. Some of Mother’s friends went to the Nazarene Church, and she would surely get wind of it. And after she heard about it, she would kill me. There were many whispered conversations on the phone that Sunday. I was able to talk Robert out of telling them my name, and I didn’t want to even whisper about it further. That sucker had to be buried alive or dead. I don’t remember how it turned out, but I think he was forced to apologize. I escaped with my “good girl” reputation intact. But the episode wasn’t over. I was not discovered, but I wound up confessing it to Mother anyway. Mother had a mental list of “Boys Who May Not Be Dated.” At the top of the list was — I’ll call him –- Bob. Patricia, my sister, had been explicitly forbidden to go out with him for some reason now forgotten. But Patricia had subterfuge in her soul as well. Bob would send a friend to our house to pick up my sister. She would then be delivered to Bob, and when they came home, he would let her off at the corner, and she always said whomever he was had a deadline to get home, and he was running late. I worried about her telling those lies, and I thought I had to let Mother know what was going on. I knew if I told on her, my sister would tell Mother about that damned “baby.” There was nothing for it but to tell Mother myself what I did, so I could then reveal my sister’s deception freely, and she would have no such power over me. Mother, of course, had a conniption fit! She and her family were world-class criers. This time, I thought she was never going to stop crying. She wept buckets and paced the floor while I just stood there totally taciturn. When the tears slacked a little, I broke the news to her about my sister. More tears. More anguish. More consternation. But what was this? She wasn’t upset about the Bob lies. She was still furious with me. A deluge. More tears. More threats. More accusations. More everything. On further reflection, perhaps I should have fessed up to the Nazarenes with Robert. It might have gone down better, and by then I would have come out smelling like a rose. But it was not to be, thanks to my postponing my just desserts; it was my lying, no-account sister who was smelling like a rose. I was stinking to the high heaven, into which my mother said I would never see. Sinners of my ilk were drop-shipped directly to the devil himself. The book is actually happening, but it won't be finished nearly as soon as I expected. There are so many family things happening this spring. It's all good, except my grandsons are getting too old too fast. Not all the stories will be in the blog. I found one just a couple days ago that was almost 5,000 words. That one is bound for the book. Now, you'll have to buy the book to see if I mentioned you. I've already told you, it's a tell-all, so yes, you're mentioned! Wanna see some great art? I LOVE the paintings of John Entrekin. 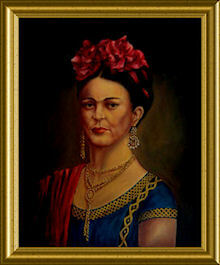 Because I also LOVE Mexico, his painting of Frida Kahlo is my favorite.